The University of Delhi takes pride in being an inclusive space, providing higher education to people from different backgrounds. Yet, some of these people don’t get what they need and deserve. On 23rd January, 2019 at ‘The Dialog’, an annual panel discussion organized by the Leadership Cell, St Stephen’s College, Shorya Sood, a wheelchair-bound M.A. Political Science student from Hindu College raised a question regarding lack of infrastructure for Persons with Disabilities (PWD) students in Delhi University. This stunned the panel, who were unable to answer Shorya’s question. A closer look at the depth of this complex issue reveals the disappointing truth of problems faced daily by PWD students. The lack of ramps, tactile paths, Braille books section in libraries, cause inconvenience to these students. While talking about these problems, Shorya told DU Beat about his attempts to bring attention to these issues. He told us how the Vice Chancellor of the University never responded to his mails regarding this issue. He also threw light on the lack of ramps in South Campus. He has been talking about these issues on Facebook and writing blogs bringing them to the notice of others, creating some level of increased awareness. In fact, even before sitting down for the talk, DU Beat witnessed an instance of these accessibility issues in real time. Due to the absence of ramps near the C-Tree area of Hindu College, Shorya’s wheelchair had to be lifted to help him enter. The accessibility issues are ever apparent in South Campus as well. Even though Lady Shri Ram College for Women is equipped with ramps and proper infrastructure, PWD students face a plethora of problems in its Hostel facility. 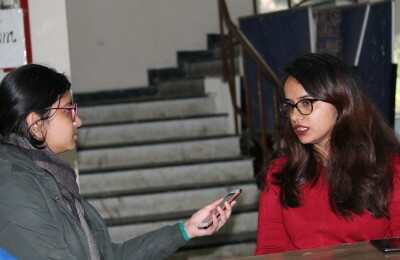 Anusha, a 2nd year student from B.A (Hons) Psychology commented that there were only two PWD bathrooms on each floor in the entire hostel and often girls who could use common washrooms, used their washroom instead, which made them suffer. She also shared that since there was no light in those bathroom, they generally had to bathe using phone torchlights whereas the administration was doing nothing to construct more washrooms. Similarly, Students’ Federation of India (SFI) Hindu College Unit sent a letter to the Principal of the college on 5th February, 2019 requesting construction of ramps and lifts in various areas. Neelanjita, a 1st Year student from B.A (Hons) Political Science and President, SFI Hindu College Unit, commented, “Principal said that the ramps will be constructed in one and half months, but lift needs 20 lakh rupees, so she did not assure that”. However, on this, Shorya said that lack of funds wasn’t a reasonable excuse, especially when colleges spent extravagantly on fests and other purposes. He also told us how the University Grants Commission (UGC) provided funds for such purposes. “Where there is a will, there is a way”, he said. Miranda House, Daulat Ram College and Hansraj College have made commendable efforts towards creating a more inclusive space. As reported in an earlier report these colleges are differently-abled friendly in their own ways. These are examples for other college to create a more inclusive space so that the presence of PWD students in college becomes more than just a proof of diversity. The simple point remains that when every student is legally entitled to an education, irrespective of their physical abilities, then universities have the responsibility of creating the necessary atmosphere to affect the fruition of this right. The need for increasing awareness and making people familiar with such issues still remains highly important. Featured Image Cation- Letter: SFI, Hindu College Unit sent a letter to the Principal of their college requesting construction of ramps and lifts.